If it ain’t broke, fix it anyway. I was keeping one eye on the score of the Broncos- Steelers game today as I was working on my computer. Not that I am particularly interested in the NFL anymore. In fact, I have not watched a game all year. But I am a lifelong sports fan. What can I say. 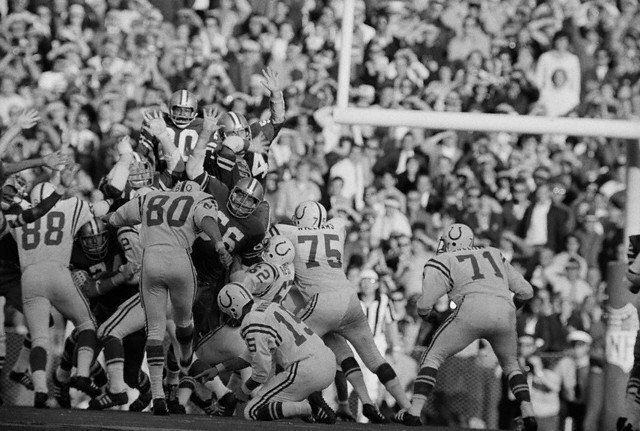 A few minutes after the game had ended I saw a clip of the winning TD catch in OT and heard CBS broadcaster Jim Nance refer to a new rule change which stipulates that in the playoffs a team on its first possession in OT has to score a TD in order to win the game. Taking the ball the length of the field to settle for a game winning FG is no longer allowed. Since I rarely watch the NFL anymore I had heard nothing about this change (which applies to the playoffs only) and I was predictably aghast. I read the game recap where the explanation of the new rule was provided. In addition to the rule that says a team must score a TD on their first possession, another new rule guarantees each team at least one possession in OT. In other words, sudden death overtime is now sudden death overtime with qualifiers. The new rule dilutes the considerable drama that is synomous with overtime in professional football. One of the more exciting things in sports is to watch a team drive down the field in OT to get into field goal position. What is more American than a field goal to win a football game. But now some field goals are not allowed. Go figure. There is no justification for this rule change whatsoever. It is just a blatant attempt by the NFL to lengthen games so they can sell more advertising during the period when most fans, including myself, tune in: the playoffs. But the NFL is just following every other institution in America in which tradition is considered boring and where the mis-guided powers that be see a need to change the product or watch it die (what they perceive will happen). Sports is now just like every other consumer product in the US. It has a life cycle. Still you wish they would leave some things alone. Like sudden death overtime.